It would seem that gardeners are a difficult lot! For those of us intent on gardening with ornamental plants we are continuously drawn to the exotic and novel, sated less and less by the plants in yesterdays’ garden…at least until those have had suitable time to have fallen out of fashion and are rediscovered. For most of us it is the plants we’ve never grown, or even seen before, that draw us. This is as true when we ourselves are novices as it is many years later. Sure, we all have more than a few long term relationships with particular plants, but we seem forever subject to the seductive calls of the unknown (to us)! For many of us this is at no time more true than when nurserymen, on the ‘cutting edge’, and plant explorers come to town, especially if they come bearing pretty pictures…Even mores so when paired with the opportunity to acquire them. Instant gratification. It is a conspiracy you know. The excitement of this is almost always paired with a particular danger inherent with the unknown, that ignorant of the requirements and ‘preferences’ of a plant, of what it takes to perform in order to deliver on its promise, we can ‘bite off more than we can chew’ and the plants will under perform or even die! The more seasoned we are, the more prepared for this challenge we will be, because we’ll have a better sense of what’s to come and a broader context, or knowledge, from which we can proceed. But, even so, new is still new and we must be aware of the hazards that could be on our way. Of course the biggest ‘hurdle’ of them all can be that of acquisition and the simple fact that as ‘new’ plants to the western garden world, availability can be very limited. New plant generally equals low demand and limited to zero availability. This void is often filled by local specialty nurseries, but there are sooo many plants. It will always be the ‘catch 22’ of the gardening world. What comes along with this is a limited understanding of just how these new and ‘untested’ plants may perform in garden situations. How cold hardy is it? How far from the conditions of its natural range can these be pushed? What is a plants natural conditions? While they may be aesthetically ‘garden worthy’ we must always be sensitive to the fact that our gardens are not their natural plant communities. This will be a series of postings taking a closer look at the plants Jimi Blake spoke of at this last June’s NPA Seattle Study Weekend. I’ve already posted something similar on the plants he presented during his Salvia talk and slide show…his second talk was titled, ‘A Beautiful Obsession’, in which he quickly covered about 70 some current ‘favorite’ plants. I shan’t discuss them all as while they all may be ‘good’ garden plants, not all of them appealed directly to me…sometimes because I’ve grown close relatives of them before and I’m just not that interested, a few because they didn’t grab me and a few more because I’ve killed too many of their relatives in my garden all ready! Again, readers should consider how the conditions of their gardens vary from Jimi’s in County Wicklow some 30 miles southwest of Dublin, a remarkable ‘mild’ region in Ireland where he lives. See the introductory portion of my Salvia post! Jimi loves this plant, he pressed it upon his sister June, though it didn’t take too much convincing, and she planted it in her garden…where it remains. Helen Dillion’s famous garden was gifted with this as well. Jimi had torn out a bed this Spring, but these small gawky, but elegant, open canopied ‘trees’, are staying…at least until his boundless energies move him on to the next plant. Growing from 6’ to ultimately as high as 30’ tall, they set a tone for his garden punctuating it, with their narrow, irregular and spiny trunks, airy branching and large, pinnate, compound and spreading leaves. The leaflets are separated with their supporting structure adorned with their own plentiful, piercing, needle-like spines, not un-like our native Devil’s Club, Oplopanax horridus, our local representative of the Aralia family, ours having simple, large palmate leaves and a preference for an over topping canopy and moist sites….Jimi’s plant lends a more exotic quality. He can garden beneath them almost as if they weren’t there, in terms of shade, so he can use all of his sun lovers beneath them. This is rare in the trade. Jimi travelled as part of the Glasnevin expedition, along with Helen Dillion, and others, to areas within central China in 2003 and they were the first to bring seed of these to the West. (These expeditions, organized by Ireland’s Glasnevin Botanic Garden, have visited different areas of China over the years.) So he has them as do a select few others he’s shared them with. I don’t know if its possible to asexually propagate these, but they don’t seem to be on Monrovias’ “to be marketed soon” list, despite the growing infatuation many of us have with the hardier Araila Family species. If its only possible to grow these from seed and Jimi’s ‘generation’ is slow to mature, it could be a while longer. I didn’t find anything that spoke to the precise hardiness of A. echinocaulis, but it is native to much of central China, between about 31ºN, south to 23ºN and the Tropic of Cancer, including Guangdong, Guizhou, Hubei, Hunan, Jiangxi, Sichuan and Yunnan provinces, in forests, roadsides, thickets and rocky cliffs at elevations from 200-1600 m, that’s 5,250′. Here’s a link that shows China by growing zone. The color coded map, like our own USDA maps, generalize and there are undoubtedly warmer and colder pockets throughout, likely varying considerably given the diverse and rugged geography. The map shows most of the area that includes this Araila as either zone 9 or 10 with a much smaller area, around Hubei, to the north, dropping in to zn 8. We currently grow many plants successfully from these provinces today, so like so much else in life, growing this here will be an experiment…of course first we would need to actually acquire them. Anyone out there with seedlings that would like to test in Portland’s banana belt, call me, I’m up for it. Another speaker at the Study Weekend, was it Dan Hinkley(? ), showed a picture and spoke briefly on Fatsia polycarpa…or am I just imagining this? This is another durable, for us, Aralia member, that not surprisingly resembles F. japonica, only with much more deeply cut lobes, and, again, not commonly available. I saw it again just recently in Loree’s Danger Garden here in Portland looking very happy and contributing its unique texture to her melange. Check out here two blog postings on this plant! Danger 1 and Danger 2. In a subsequent ‘go through’, while working on this posting, I decided to mention three other Aralia family plants, Oreopanax echinops, O. incisus and Schefflera kornasii on Jimi’s list. Again, these are rare in the trade and unless you have plant explorer friends in Mexico south into Brazil and Argentina your odds of coming across any Oreopanax is slim. 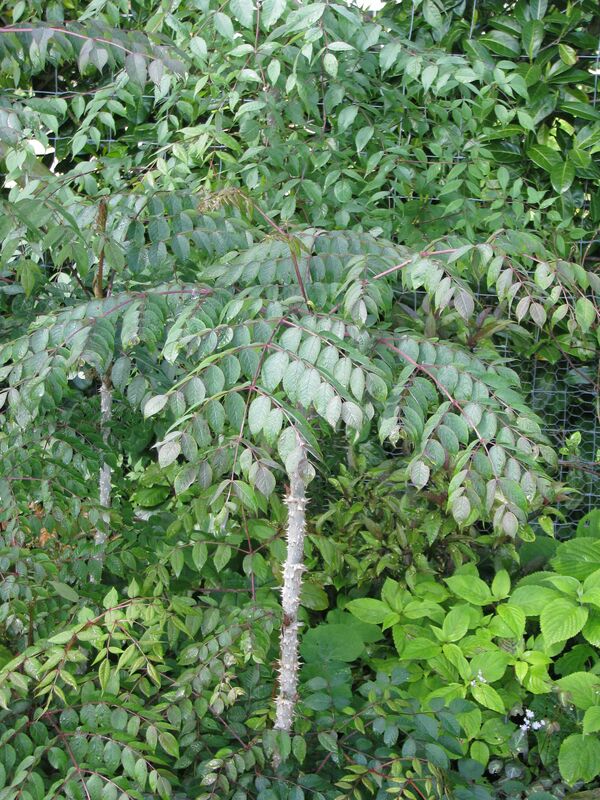 Oreopanax are only found in the more ‘central’ portion of the Americas and is comprised of species which are generally evergreen having leaves that can be simple, compound or variously lobed, as are many of the other genera in the family. They all have the characteristic inflorescence of members of the Aralia family, but DNA that separates them from other closely allied genera. Photos of O. incisus leaves show its variability but tend toward a uniquely cut silhouette. Those of O. echinops have a silhouette reminiscent of a Horse Chestnut leaf. While researching this I came across the page for Oreopanax spp. created and supported by iNaturalist, an app specific site created for citizen-scientists, and serious researchers, who by their participation create the data that can be observed on this site. When these participating researchers submit data it includes basic and important information that is attached to a photo of the observed specimen. This includes GPS data so that it can be mapped, and evaluated. Its a very cool site that shows where and when a specific plant/organism was observed. Many research groups are using the app as it is a very convenient way to track and organize data, in addition to making it available to a wider audience. 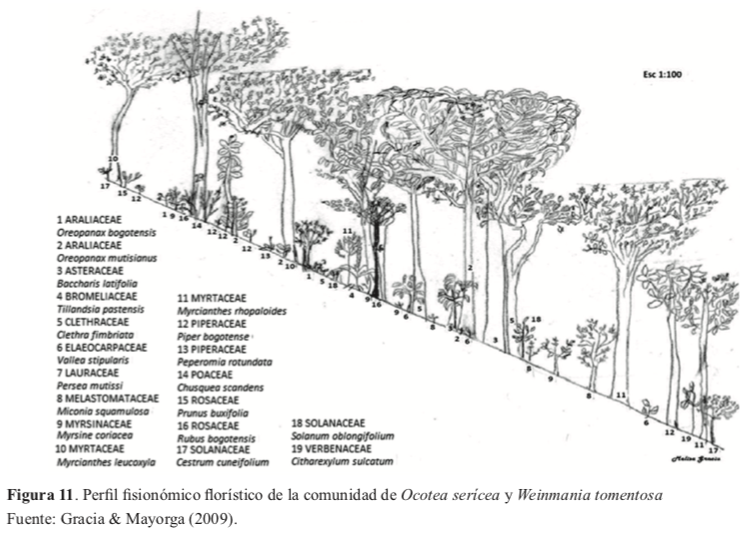 I captured this from a PDF titled, “Diversidad y Charactizacion Floristica de la Vegetacion Natural en Tres Sitios de los Cerros Orientales de Bogata D.C., by Edgard E. Cantillo Higuera and Melisa Garcia Cuellar…I’m sure it’s an interesting read, in Spanish, but I love the several illustrations they include of sections of hillside plant communities near Bogota. It shows the spatial relationship of the listed species, in this case including two Oreopanax species, neither of which are the ones discussed here. Taking the climate, soils and aspect together with this pattern of growth would be very helpful when considering how one might plant these in their own garden. It would be helpful to have such drawings when acquiring new plants. iNaturalist’ accumulates and maps all of the data/sitings of Oreopanax spp., both those made in situ as well as those planted in landscapes, wherever the researchers are looking. Of course the ‘survey’ is not definitive or remotely exhaustive and obviously leave out areas where participants have not looked. This data set is relatively small with limited observations and, by looking at the submitted photos it does give me pause to wonder whether all of the samples are indeed accurately identified, there will always be some degree of variability within a particular species…still it gives you a very interesting look at where these plants have been found, which by extension, can be helpful in determining its hardiness and appropriate uses in the landscape. The site will become more valuable as data is added over time. This link is to the page for Oreopanax incisa and shows the locations in Colombia’s mountains where participants have found them. It shows a concentration of them in Medellin, I’m sure in part because this is where investigators live and have looked. This is the link for Oreopanax echinops, which includes a very small sample size. I believe these pages are ‘current’ including new data as it is submitted. iNaturalist’s map shows O. echinops clustered in the mountains of Central Mexico, but again because of the small sample size….There is not a lot of information on line about this genus and much of what little there is, is in Spanish. As I said very cool. iNaturalist could potentially be used to survey rare plants around the world by local citizen/scientists and formal scientific studies. And now, lastly, that Schefflera kornasii with the collection number BSWJ 11830. BSWJ denoting this as one of Bleddyn & Sue Wynn-Jones’ finds. This plant hunting couple from Crug Farm in Wales are prolific collectors in SE Asia over quite a few years. Here’s a link to their nursery that lists all of the expeditions they have been affiliated with. You must go through their website. Their work has been astounding. Their catalog is reflective of their expeditions often listing multiple plants of the same species each from different collections. 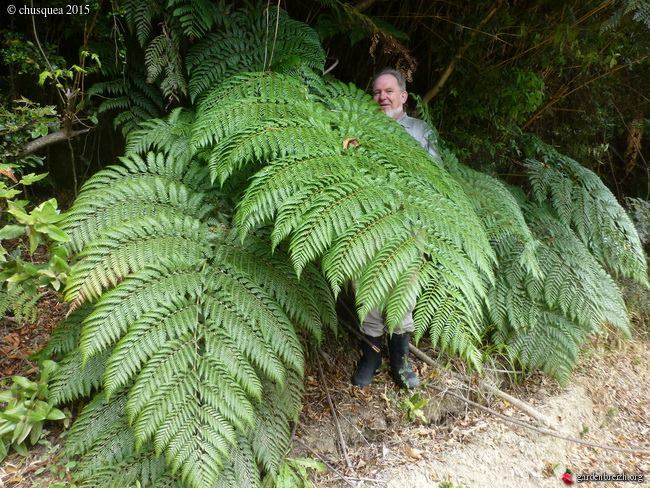 Here’s a link to their catalog listing for Araila vietnamensis, which the family member with the possibly the largest compound leaves in the world, up to 2m long! …..Remember Fan Si Pan, or Fan Xi Pan, is that last mountain in the Himalayan chain, this plant came from there, at about 8,200′, and has been identified as separate from S. vietnamicum. vietnamensis or whatever it is. Here’s a link to a photo from a blogger in the UK, Alternative Eden and a few more from Asian Flora. It is indeed a handsome plant especially with its purplish stem and petiole color..
Lophosoria quadripinnata. I’m imagining this dominating/looming in the corner of a small shaded patio, growing from a high planter above the occupants heads in their moderate maritime garden, underplanted with little compatible treasures, including a Lapageria rosea…and maybe representatives of all of the other plants in this post! This is said to be a genus that once occurred across much of prehistoric Gondwana the super continent that once contained most of the land mass now spread across the southern hemisphere and beyond, back when ferns and tree ferns dominated land plants, before the existence of Angiosperms. This is a mono-typic genus, it contains only one species, though it has been suggested that there are several subspecies. For a more technical look at this plant check this link which has pages which go on to describe the Chilean flora of which this is a member. The species name, ‘quadripinnata’, because each leaf is four times pinnate, divided, the ‘tiny’ leaflets are each on a ‘stem’ on a ‘stem’ attached to the mid-rib or rachis of the larger leaf structure. So, there’s that and then the scale of this plant and its height, to 3m. If you want to see a photo that will blow your socks off click here (it will take you to the photographer’s flicker page) and then zoom in! It shows an entire hillside of this fern in Chile’s coastal mountains. The genus is a member of the Dicksoniaceae, a family of tropical, sub-tropical and warm temperate ferns, some of which are tree ferns closely related to the Cyatheaceae. While not ‘technically’ a tree fern, Lophosoria is sometimes seen to form significant trunk like stems, at least in Mexico’s mountains along its eastern Gulf coast, the shear size of its fronds rival those of most tree ferns. This fern is said to be intolerant of snow across its Chilean range, but can tolerate occasional freezing spells of about – 5° C (near 20ºF)(the typical morning frost of central Chile) though others claim that in central Mexico, at the northern extreme of this fern’s range, it can go down to -10C, or 14F, while another claimed -13ºC, suggesting that without too much effort some sites here in the PNW may be suitable. It’s also interesting to not that this isn’t particularly fussy and is reported to be fairly common as an early occupier of heavily disturbed sites within its native range. Such adaptability is a good sign for those who garden far away. In Chile it can be found in low interior valleys and coastal mountains, in some cases down to sea level, ranging as high as 2,000m or 6,500′. These areas are humid and receive near constant precipitation, experiencing only very short dry periods, rarely ever going without for a month. Successful areas are shaded without direct sun, often beneath 20-40% vegetative cover. The sites may also be steeply sloping away from the noon sun with 40-80% vegetative cover or in steep ravines with heavy tree canopy. Moisture and shade are operative here. I’m going to make the leap and say that on the more ‘open’ sites, more regular rainfall is probably required, which would likely also have a temperature moderating effect. Given this, Portland might be a tough site for this fern in terms of survival, especially given summers like our current one which is setting heat records in combination with below average rainfall so far for the year, but our summer dry climate here is always going to be more problematic, while plantings in our coastal areas in the PNW and Puget Sound would probably fare better. This is generally the case for many of the southern hemisphere maritime plants we keep seeing popping up from places like the Chilean Rain Forests, Tasmania, New Zealand and SE Australia. Here’s a short video, produced by the Royal Botanic Garden in Edinburgh, showing this fern with a description by a botanical artist. Video. I’ve tried and killed Dicksoniana antarctica, a close relation of Jimi’s choice here, a few times in my garden. I’ve learned quite a bit more about them since then and think that I could probably get them to endure, even grow here, but, as is so often my problem, exactly where in my garden could I do this and what would I have to sacrifice to make space. My failure with it isn’t really an embarrassment for me, I know people who have been successful wintering them outdoors here, because they have been more committed to the extraordinary steps they require. This may be a similar situation with this Lophosoria. Still the question remains of where would I plant it where it can grow successfully to best prepare it for the rigors of winter? I think its space requirements may very well eliminate it from my garden. Once choosing/creating an adequately protected and supportive site it will be one more plant to fret over during cold snaps. If I have to bring it ‘in’ it would take a considerable amount of my limited indoor wintering space? I think I’ll let others with more space test this out. I suspect provenance will be important with this plant, just as it is with many others, plants of the same species coming from colder regions having adapted and developed more cold hardiness. Podophyllum spp. and their hybrids have been popular in the PNW for a number of years now, many regional gardeners growing them very well and the newer forms are often highly sought after. In his tours of gardens in Seattle, Jimi, was a little surprised at how many well grown plants of these he saw, feeling a bit like he was ‘bringing coals to Newcastle’…that does not diminish their beauty or value as subjects for our gardens. There is much good info published, especially on line on these…even I’ve made a post on the trials and tribulations i’ve encountered growing them. Still, Jimi’s pictures were beautiful and these two species caught my eye. Podophyllum aurantocaule is offered by a relative few nurseries, in the PNW, places like Keeping It Green Nursery and Far Reaches Farm, in fact check out the latter’s Podophyllum page…impressive! though they don’t include the above listed P. chengii ‘Hunan’, in fact I found very little about that one. You will also see that several former Podophyllum are now travelling under the moniker of Dysosma, a result of the continuing genetic work being done in botany that has been rewriting lineages based on direct genetic descendency in recognition that morphology, plant structure or appearance, can vary widely, plants from different genetic lines can exhibit very similar physical characteristics, a fact no experienced gardener should find too surprising, given a little thought. This entire group, including Podophyllum, Dysosma and Sinopodophyllym can be grown west of the Cascades. As a group they are entirely cold hardy here, as long as their cultural and site requirements are met, primarily shade and moist, well drained soils with a good proportion of organic matter. They all come from regions of summer rainfall. I doubt that there exists a gardener who can resist the seductive powers of at least one Orchid. In a group with around 28-30,000 species and upwards of 100,000 registered selections and hybrids, there will be at least one that will draw any one of us in. With legions of afcionados there are likely several hundred thousand more unregistered hybrids. Many Orchid species are very subtle in their appeal, like several of the PNW’s native species, while others ae both exquiste and fantastic in their form and delicacy, though the flowers themselves are often quite durable, not that you should ‘abuse’ them in any way. For me, if you place the descriptor of ‘hardy’ in front of it, I’m going to at least check it out. I grow an assortment of Bletilla striata cultivars, the Chinese Ground Orchids, and they have proven to be incredibly durable performers for me. 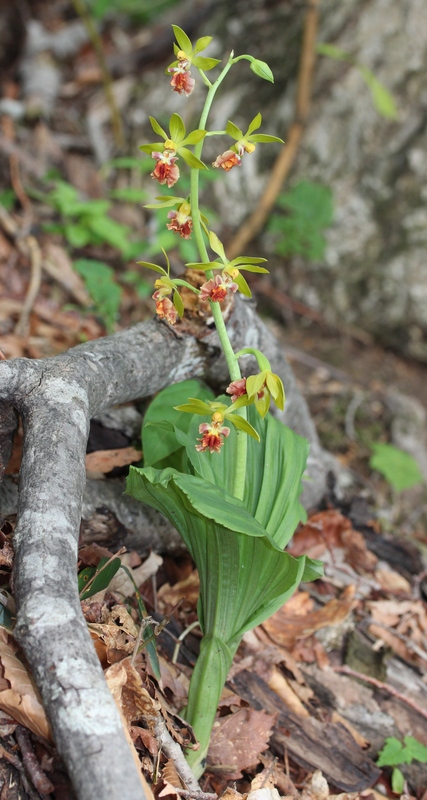 I, perhaps too casually, have tried a few of the hardy Cymbidium and Cypripedium species…and lost them, a number of years ago. It was the group of Lady Slipper Orchids, including our beautiful and nearly impossible to grow in the garden, native Calypso bulbosa, that first drew me to the family. Pleione is another genus of mostly terrestrial Orchid I’ve failed with, again too casual in my approach. The rhizomes of terrestrial Orchids tend to grow in the uppermost portion of the soil and require adequate aeration. Heavier soils, especially over our wet winters, will be their death as they are unable to defend themselves against the many species of decay organisms that inhabit these soils. Though it is often dangerous to assume such things, the bulk of Orchids are either epiphytic or lithophytic and of tropical origin, though there are notable exceptions, with a good number growing well into temperate regions and even a handfull beyond that. In fact the only places you won’t find any of these are in deserts and Antarctica. As humans and gardeners that is often what we do, we assume things. I found this picture in the Wikimedia Commons. Here you can see the pleated leaves that are common with many orchid species. Calanthe tricarnata, as is true for all of the genus, is a terrestrial, ground growing Orchid. The genus is composed of nearly 200 species, mostly tropical and mostly native to SE Asia, though some species range as wide as Mexico and Central America…C. tricarnata can be found growing between 4,200′ and 11,500′ elevations of China into Tibet, Bhutan, Nepal and northeastern India, even Pakistan, being quite common in the Himalayan Mountains in this elevation range, across grassy and forested landscapes, east all of the way to Taiwan, the Rykuyu Islands, where Musa basjoo and Fatsia japonica can also be found, on north into Japan. These are all summer rainfall regions. This is a smaller, zn 6, plant, evergreen down to 10ºF with 15” tall flower spikes in early spring of yellow flowers that include a brownish-red lower lip…these are said to be reliable here with typical ‘woodsy’ conditions often found in clumps on downed rotting logs. It would be very nice in a sweep. I’ve never seriously considered these before. Some Orchids, not this one, have Red Listed Status by the IUCN, which ranks them on a continuum from plentiful and secure to critically endangered and threatened with likely extinction. This species is not endangered and is still found to be locally and regionally secure. Orchids, as a group, have a high likelihood of being listed, because the populations of many species tend to be small and local, supremely adapted as they are to often very small and specific niches, as well as being highly dependent on very particular mycorrhizal relationships, which makes them more subject to extinction. Along with the usual threats to their existence related to habitat destruction, invasive plants and the newer issue of climate change comes their too often over collection by the nursery trade, local, regional and international. When buying species orchids, know your source. Were they wild collected? If they were, don’t buy them! I don’t want to be too redundant here so I encourage you to go on and read the very good overview of orchids, penned by By Dennis Carey and Tony Avent and available on the Plant Delights website. This photo is attributed to Paddy and was posted on the Irish Garden Plant Society’s web page. In the early ’90’s I attempted a few woodland bulbs along the edges, fence lines and near my perimeter small young trees that did not do well. My Willamette Valley loam, despite all of the compost I put on it, baked in the dry summer heat, opening deep cracks. My garden was too sunny and warm, hot, through the summer, for many of the woodlanders and Himalayans I coveted at the time. I quickly lost most of my Trilliums and other woodlanders as well in spite of my best efforts. 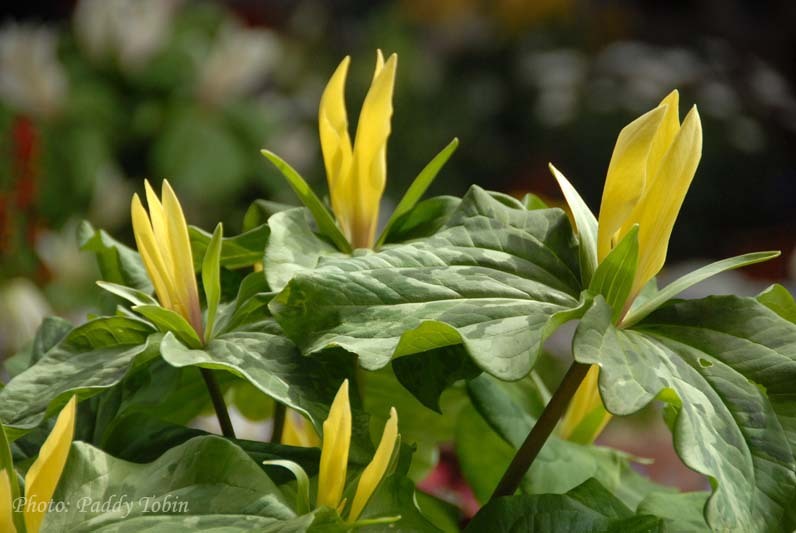 I have one remaining clump of Trillium sessile, a plant that ranges across the southeastern US, that returns each spring beneath a Stewartia monadelpha that is shaded by a fence as well. In another spot I lost the yellow flowering form, Trillium sessile var. Luteum, that held its 3 petals erectly. It’s failure in my garden is a little confusing unless the yellow form is just more particular and less adaptable in its requirements. I remember it fondly…it reminds me of the pictures Jimi showed us of his plant, T. chloropetalum ‘Bob Gordon’. My records are scanty enough from then that I’m not even entirely sure that it was a form of T. sessile, but I think it was. It doesn’t matter, it was beautiful. I would love to have something like it back in my garden. Anyone into Trillium knows that there are alot more out there than our lovely T. ovatum. Here’s a link to a Danish site featuring pictures of many forms, but not ‘Bob Gordon’, which seems to be only locally available in the UK. This site includes many pictures of their mostly woodland plants and collections, including this shot of Trillidium govanianum another genus and species I’ve never heard of, apparently a mid-way between Trillium and Paris from the Himalayas!!! T. chloropetalum, the Giant Trillium, is native to the central California coast. It earns its common name justly at it rises on stems to 18” tall and holds its petals erectly, generally in very dark ‘red’ shades, though various color forms have been selected. As another west coast plant one might think it very tolerant of our dry summer weather, but its prefered conditions are the wet seeps and creek bottoms of its native coastal hills and ‘mountains’. The species has been recognized as one of the Great Plant Picks for PNW gardens. As is often the case, when Pacific Horticulture publishes an article gardeners should take notice. Here’s a link to one, from ’05, on this species and its very threatened homeland, the Santa Cruz Mountains. While Jimi and his fellow gardeners across Ireland and the UK fuss over the treasures they’ve discovered around the world, and justly so, we the ‘stewards’ of these species’ homelands too often continue in our ‘assault’ on the native landscapes that supports their too often shrinking indigenous populations. Just where did the selection, ‘Bob Gordon’ come from, why Jimi’s own Ireland, grown from seed collected and shared by the eponymous gardener. Check this out!